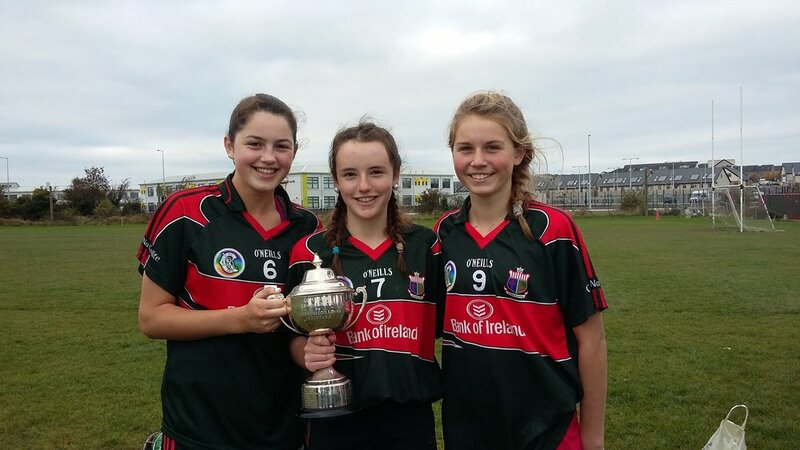 Sacred Heart Clonakilty Crowned, All Ireland Junior Camogie 7’s Champions. The Junior Camogie team were crowned All Ireland Camogie 7’s Champions in Ashbourne, Co. Meath on Saturday 29th of October last. Having won the Munster competition at the beginning of the month, the provincial champions followed this magnificent win, by capturing the All-Ireland trophy. The Sacred Heart girls captained by Daire O’ Brien first played 3 group games against, St Louis of Ballymena, Castlecomer of Kilkenny and Clare Galway from Galway. After a slow start against St Louis, Ballymena the Clonakilty students eventually took command of the game. With the tactic of a rotating goal keeper, employed by coach Mr. Brian Daly and solid defensive play by Kellie O’ Gorman and Leanne Sheehy, the Sacred Heart forwards punished the Ulster champions with a run of goals just before and after the half time. Anna Flynn from the Ballinscarthy club proved to be a handful with her direct running. She was ably assisted by the inform Barryroe native, Grace Tobin who finished the game with a brace of goals. The final score was Sacred Heart, Clonakilty 9:3 to St. Louis Ballymena 3:1. The second group game against the Leinster Champions, Castlecomer from Kilkenny became a game of complete contrast from the first group game. From the start the Kilkenny team employed a teak tuff defensive wall against the Munster kingpins. It proved to be an effective tactic as the free flowing scores witnessed in the first game evaporated in a game of high tension and drama. Castlecomer, playing against the wind, were first to raise the green flag with a well worked goal that caught the Clonakilty defence on the counterattack. This was followed soon by a point and the Sacred Heart Girls were beginning to look in trouble. Then Hannah Sexton from Timoleague got a hold of the game with her athletic style and powerful runs punishing the Kilkenny champions. Soon the Clonakilty students were back in the match when captain Daire O’ Brien, billowed the net after a sustained period of pressure. The second half was very keenly contested with the smallest of plays becoming battles in their own right. The Clonakilty revival was now well under way with Claire Kingston and Emma O’ Driscoll magnificent in defence, Annie Condon and Hannah Sexton, dominating midfield and the speedy Jessica McCarthy making a difference up front. Scores were hard to come by however until Katelyn Dineen, showing what a class act she is and fired over two points of high calibre. It was all Clonakilty now as tensions threatened to boil over as the game entered the final minute. The Castlecomer students in the last play of the game after some sustained pressure, displayed the grit of many Kilkenny teams and equalised with a brilliant point form midfield. The game ended 1:2 apiece. The final group game against Claire Galway from Connacht was business as usual from the students of Sacred Heart with Eimear O’ Brien, younger sister of Daire displaying a master class of intelligent Camogie that resulted in a tally of 2 goals. The Ballinacarriga sisters tormented the Galway defence with trickery and absolute ball control that inspired the team on to a gallant victory. Jessica Sweeney netted late in the first half and this was followed by scores from Katelyn Dineen (goal) and a great point from the flying Anna Flynn. The final score was Sacred Heart, Clonakilty 3:3, Clare Galway 2:1. With Sacred Heart and Castlecomer on top of the table on equal points after the group stages, both teams automatically qualified for the final. The Clonakilty students adopted a different approach to the drawn match, which was to be decisive. Acknowledging the strong defence of the Kilkenny students, Coach Mr. Brian Daly directed the team to play a more expansive game on the wings. This was to prove the master stroke as it stretched the Leinster champions and cracks began to appear. With Claire Kingston lording the defence, Hannah Sexton partnered by Annie Condon again punishing the Kilkenny midfield with their strong running and the two O’ Brien sisters on fire up front, the Clonakilty students dominated the first half scoring 1:5, the gaol coming from young Eimear O’ Brien. Castlecomer game thundering into the game and scored 1:1 in a matter of seconds and the final was now truly alive. After the interval, the Clonakilty students got out of the blocks quickly with Daire O’ Brien and Anna Flynn chipping over for points. Then a long ball from midfield saw first year student, Kellie O’ Gorman, normally a back, win a ball that she had no right to win. She turned her defender using her low centre of gravity and finished to the net losing a boot in the process. It was for Clonakilty to loose now as the game entered the final minutes. A late goal and point from Castlecomer made it edgy for the travelling West Cork contingent, but indiscipline allowed two pointed frees from Daire O’ Brien to put the game beyond the Kilkenny team. The All Ireland winners were presented with the cup by President of the Camogie Association, Catherine Neary.